CES is supposed to begin next week, but the press releases have already started coming out. Logitech is one of the companies we follow closely here at AnandTech. This CES, they are coming out with two new products, the Logitech HD Pro Webcam C920 and a novel mouse design in the Logitech Cube. We will write about our impressions of the Logitech Cube after using it first-hand at CES next week. The webcam announcement, however, is interesting for a number of reasons. A follow-up to the Logitech HD Pro Webcam C910, this version brings an on-board H.264 encoder to enable full 1080p video encode without taxing the CPU. It also coincides with the availability of Skype 5.7 Beta which enables full 1080p video conferencing (Hopefully, Google Talk will also start supporting 1080p soon). In addition to HD video calling, the unit also supports 15 MP photo capture. Dual stereo microphones with noise reduction round up the audio side. 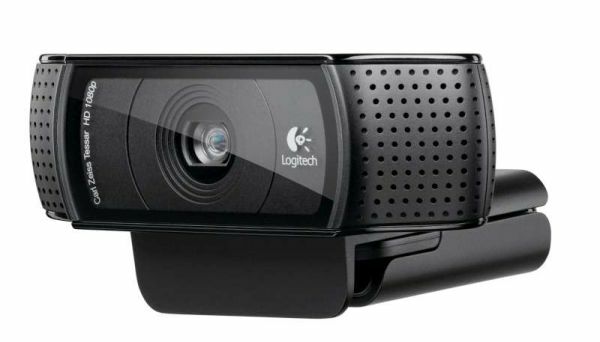 The only 1080p webcam with an on-board H.264 encoder to guarante 1080p recording at 30 fps had numerous other issues, resulting in a number of negative reviews. The unit is expected to hit the market later this month with a suggested retail price of $99.99. We will have some hands-on time with the unit at CES and report back on our experience next week. If the encoding hardware is not present in the C910 (which I own), then it's not possible. Really, how many could do an H.264 30fps stream justice. You need about 10Mbps to cut the mustard at 1080p using x264, I don't know what encoder they're using exactly, or what bitrate, but I guarantee most people buying this will not have the upload rate to cope with it, and you'll get a compressed mush going out that means you may as well have bought a regular 640x480 webcam with a good frame rate and less compression. is a Harmony remote, that can aslo be used for a HTPC out of the box (with a nano recevier), that has a smal QWERT backlit keyboard on the other side, and acts like a Logitech Air mouse.